Yay! Today starts the Blogger Quilt Festival, hosted by Amy's Creative Side. I've had a hard time deciding which quilt to show-- and much time wishing I was working on another quilt project! I have missed it. . . This little quilt was a baby gift for my cousin's baby. It was a fun quilt to put together. And I learned the benefits of adding a little bit of white fabric-- it can make a quilt pop! And since I have tons of scraps from this quilt, let's do a giveaway, shall we? To recieve a LARGE number of scraps from Keri Beyer's Rocket Scientist line, leave me one comment on this post with a way to contact you, should you win. Voting continues for another day! Bummer, the first one never wins! Love the rockets - thanks for the opportunity. Love this quilt, the fabrics are so fun! Thanks for sharing! #3! I love that fabric, great for some boys! Beautiful quilt! Great fabrics and colours. Thanks for the great giveaway! Great Quilt!!! Love the colors! Sometimes, so simple is best...looks great! Wow, this is a great quilt! I've been trying to figure out what to do for our two boys who share a room (soon to be 6th and 9th graders...) I think I have finally hit upon it! Thank you for the inspiration for the pattern!! What a cute quilt! I love playing with scraps. 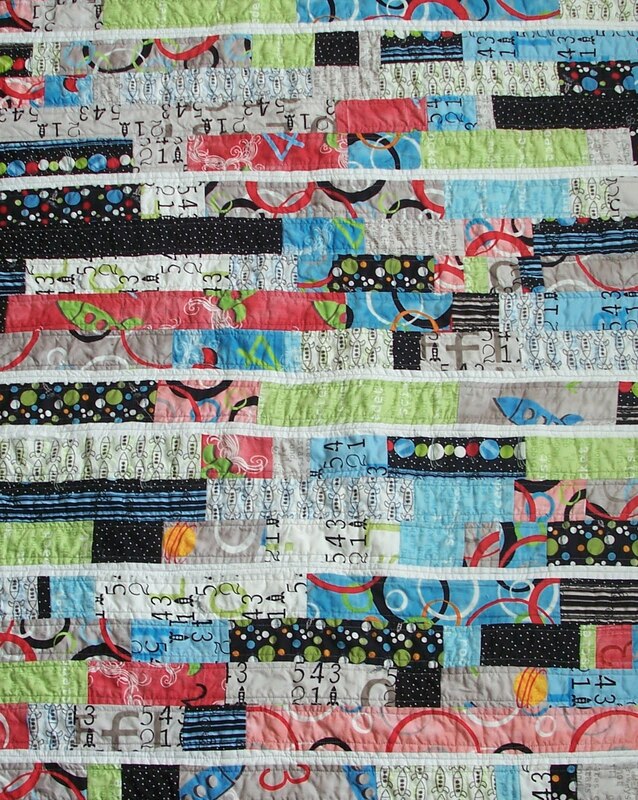 Great use of color, I love scrappy quilts! that quilt is adorable! and I love the fabric! Cute quilt--so bright and cheery! I'm sure your cousin and the baby love it. Thanks for the chance to win some of these scraps. That quilt is great! I would like to make something scrappy like that for my boys. Girl stuff is easy, but I find it hard to be original for my boys! Wow! I have never seen this fabric. I am doing my youngest son's room in space theme. Thanks! love the quilt and how the colors stand out against the black and white! thanks for the chance! I LOVE this. I am always looking for new boy quilt ideas. And I would love your scraps. Thanks for a chance to win. Oh, thank you for the chance to win! This quilt is absolutely wonderful! What a lovely quilt! Thanks for the chance at the scraps!!! what fun fabrics for a baby quilt! thanks for a chance...already voted for my favorite quilt! can't wait to see the winner! that sounds really fun!! Thanks for the chance!! I love the quilt...that would be wonderful for a baby!!! What a fun concept for a fabric line! I'm sure I could think of something fun to do with the scraps. wow - i wish i could make a quilt like this! Oh I love scraps!!! What a pretty quilt! Thanks for the chance to win some of that loveliness! I'm dying to quilt but so scared to start! Love the colors in this! It's beautiful. WOuld love to win. You're right, that bit of white really does make it POP! Love it! Please enter me in too! I love the long strips of fabric. Very cute. The colors are rad too. I really like your quilt! How sweet to throw in a giveaway! What a gorgeous quilt! And thanks so much for hosting this giveaway and introducing me to the Rocket Scientist line (my husband is an actual rocket scientist!)! That is a B E A Utiful quilt! You never fail to inspire me with your awesome quilts! I really love all the fabrics you used! Love this quilt, the sheer randomness of it, just terrific. I love the fabric, I'm always looking for boy friendly fabric. Thanks for the giveaway! That's a fabulous pattern! And, I simply adore the Rocket Scientist line. Thanks for sharing! any scraps are welcome in my house! I love scrappy quilts. And I love scraps! But I'm a fairly new sewist, so I don't have so many yet. That's an adorable quilt! I'm loving the variety that people are posting for the blogger's quilt fest! Another giveaway?! You are so generous. And I love that quilt. I just starred it in my reader, because I think it would be a perfect design for a charity quilt - so flexible, but still awesome looking! Thanks for the inspiration! I'd love to add your scraps to my scraps. Then maybe I'd have enough scraps for a quilt! One person's scraps are another person's treasure! Love scraps. When my scraps get too little to use I give them to my daughter for her preschoolers to use. Thanks for this giveaway! I love this quilt! Simple but very striking. Getting ready to start my first quilt and love the fabrics you chose. That's such a fun quilt and awesome fabric! Love it! Oh, I would adore your scraps! Thanks for the fun offer! You're right, those narrow strips of qhite really make the colours pop. Great quilt! Love those fabrics and like you, I've found that many times just using some white really changed the outcome of the quilt. love the quilt layout...so simple & modern! Love the quilt. The white addition does make the colors pop. Thanks for offering up the scraps! Great quilt. I like the bright blue in it. Cute quilt and a great giveaway! I have 2 girls and tons of girly scraps, I could really use some boy ones to make quilts for all of my friend;s boys who have just been born! What a cute, fun quilt! Love scraps! Thanks for the chance to win some! One of these days, I have to win one to these! What a cute baby quilt you have made. The scientific fabric is really fun too. Perhaps I will win some of your scraps! VERY cute design and adorable fabrics! Love this fabric! What a great quilt for a boy! What a great quilt! Thanks for sharing it for us! that's a great quilt and I agree about the addition of white- it really helps the colors shine! Great quilt! It's amazing what a difference those little strips of white make. Genius! OK, I love, love, love this. I would have commented even without the giveaway!!! However the fabric is wonderful. Thanks for sharing!!! Love the rockets. They are a lot of fun. Thanks for sharing! Those little strips of white make the quilt sparkle. I always like baby quilts that are not as much baby as works of art for those new baby brain cells! Cute quilt...would love to win! Love the quilt and love the fabrics! My oldest loves all things space, so I would love to use those scraps in a quilt for him! this is amazing...i love the variety and the pop of the white makes all the difference. Wow! You are so right. That white makes such a difference. It seems that so many quilts that are binding to binding busy fabrics just melt together. The white gives the prints definition. that is a lovely quilt. Love your white 'popper' strips. They work beautifully. 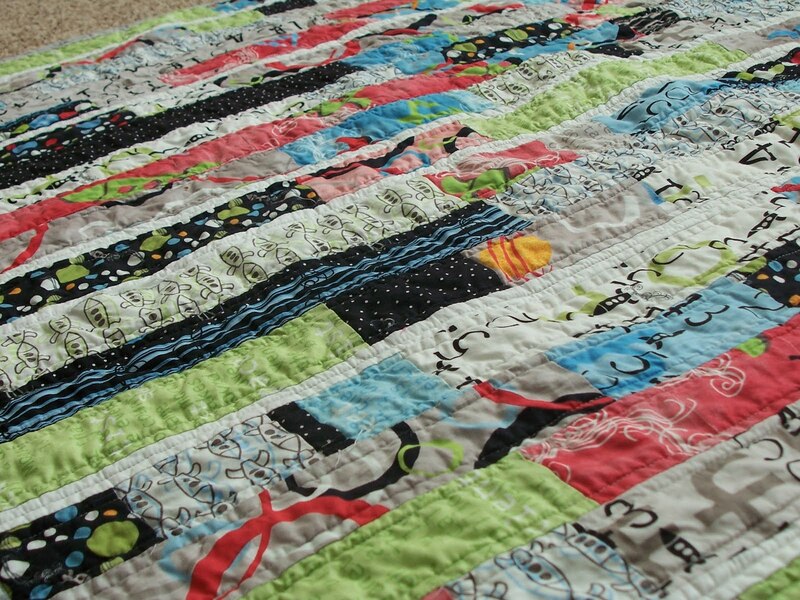 What a great quilt..and i love scrap projects!! Would love to win those! ps love that reversible dress you made..I'm going to have to try that! I love this quilt! And I loves me some scraps--the more, the merrier! beautiful quilt! thank you for your generosity! The quilt is great! My soon-to-be-daddy son-in-law would love it - he's an electrical engineer and would really relate to your scraps. This is so unique! I love it! sweet! two birds with one stone! meet a new blogger and enter a giveaway. I LOVE your quilt! great way to use scraps which i agree with from a thrifty (more like cheap) person's perspective. and it is beautiful to boot. great choice for the festival! gorgeous quilt! thanks for sharing it, and for the giveaway! How nice of you to share your scraps in a giveaway. Have a great festival experience. Thanks for a chance to win some great fabric. Great colors and I love your quilt! what a bright cheery quilt. Thanks for sharing. Love the quilt AND the fabrics. Super cute!! I agree. The white really is a great accent on your fun quilt!